Cygnus Destroyer Takes Aliens Colonial Marines to Court! Aliens Colonial Marines is the Gearbox and Sega 2013 smash failure that many view as one of the worst games of all time. Because of this and the release of the brand new Alien: Covenant film Cygnus Destroyer takes Aliens Colonial Marines to the Innocent Until Proven Guilty court. It's a solid review and I think his take is fair and now that all the hype of this game is over I think people can look at it again with a fresh perspective. Aliens Colonial Marines is the Gearbox and Sega 2013 smash failure that many view as one of the worst games of all time. Because of this and the release of the brand new Alien: Covenant film Cygnus Destroyer takes Aliens Colonial Marines to the Innocent Until Proven Guilty court. It's a solid review and I think his take is fair and now that all the hype of this game is over I think people can look at it again with a fresh perspective. 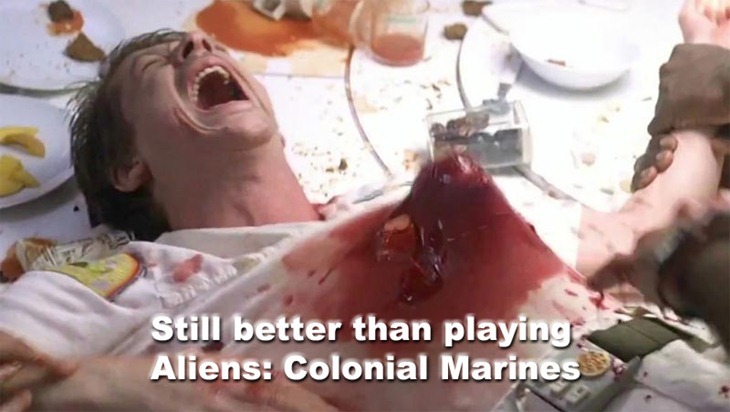 Aliens: Colonial Marines: Is it really that bad? Aliens: Colonial Marines came out the gate mired in muck. I had high hopes for this game. Great source material, developed by Gearbox using the Borderlands 2 engine, it just seemed destined for awesomeness. But then the prerelease reviews started flowing in and it became clear that buying this game was not in your best interests. Sloppy alien AI preventing them from even reacting to your presence, save-wiping bugs, texture issues, the list goes on. It was cheap a few weeks back so I grabbed it and put a few hours into it. So-- is it really that bad? No, definitely not. At least not anymore. I generally don't pay much attention to reviews when deciding to buy a game or not, because more often than not I feel like the emphasis is on the wrong things. This time, though, I listened. Technical issues aren't a matter of opinion. But since then there have been a couple of massive patches, one of them 5GB, big enough to be a game itself. Most of the technical issues have been fixed, which lets us evaluate the game based on what it was meant to be. The graphics are good enough, but not great. The voice acting is good enough, but not great. The plot is good enough, but not great. See the pattern? The friendly AI is still not perfect. Your teammates will sometimes get a little stuck. Sometimes the difficulty curve is wonky, throwing you at a brick wall when you aren't expecting it. A minor problem I have is with the concept itself. If I, a lone marine with a machine gun, can take down wave after wave of aliens, then it significantly diminishes the danger level in the movies. Ripley is deservedly known as a badass for taking down one in the first movie, but I just took out like 80 in 5 minutes. I'm aware that you can't really make a game in this franchise without that, but it's still a bit of a disconnect for me. One that I can luckily ignore. But the gameplay, the gameplay is quite good. If you've handled a gun in Borderlands 2, you know what to expect. Fighting off waves of xenomorphs is damn fun. But was it too little, too late? By the time the massive patch came along to fix the most egregious bugs, public opinion had already turned against A:CM, and for good reason. It definitely won't be the success that it could have been, but the good news is that you can get your hands on it for cheaper, sooner. A:CM also raises some questions about how games should be reviewed. Even after the patch, there are still a lot of flaws. In fact, I spent most of my time in this post writing about the flaws. But the game is fun despite itself, and fun is what we play for. This is why I don't like the number rating system. If I was rating this purely on fun, based on what I've played so far I'd probably give it around an 8, but would feel the need to subtract from that due to the problems still present. The truth of the quality of this game is more complex than a number can represent. I'd just say, give it a shot when you can find it for a good price, just go into it expecting some issues and try to look past them. If you can, you might just have a lot of fun. Interesting, thanks Travis. I love the Alien franchise so, like many I was stoked to hear about this one. Good to hear they worked out some of the issues post release. I light nab then when its cheap. If you do, I smell co-op. Ah cool, I didn't know it came with that. That could be fun. Oh and, in Aliens they do kind of mow through them for a few scenes anyway. Ultimately they get their asses kicked, but in a straight fight the Marines are the superior force. Sort of. Aliens: Colonial Marines trailer is just bad. I loved the Aliens games back in the day, and I love Gearbox Software, so the pairing of the two leaves me really interested in this game. Even this terrible trailer can't change my mind. The voice-over is so cheesy. It's like an 80's Army B-Movie. Mikey Neumann from Gearbox, the head writer of Colonial Marines (and the voice of Scooter... CATCH A RIIIIIIDE!) felt the need to publicly disown the dialogue. But it's ok. A fan fix for the trailer was released. https://www.youtube.com/watch?&v=H20QEkP-UOk I loved the Aliens games back in the day, and I love Gearbox Software, so the pairing of the two leaves me really interested in this game. Even this terrible trailer can't change my mind. The trailer voice was REALLY bad. I would say its not like campy bad, its just really bad. The visuals look great, I bet the game will be great, but the trailer was terrible.